Certain pastimes were restricted to the chiefs, the most spectacular being hōlua sledding. A track of rock, layered with earth and made slippery with grass, was made for tobogganing on a narrow sled. Hōlua sledding was the most dangerous sport practiced in Hawai‘i. The rider lies prone on a sled the width of a ski and slides down a chute made of lava rock. The sled or papa consisted of two narrow and highly polished runners (three inches apart,) from 7- to 18-feet in length, and from two to three inches deep. The papa hōlua (canoe sled) is a reflection of the double-hulled canoe. The primary archaeological feature of Keauhou was its monumental Holua Slide, a stone ramp nearly one mile in length that culminated at He‘eia Bay. 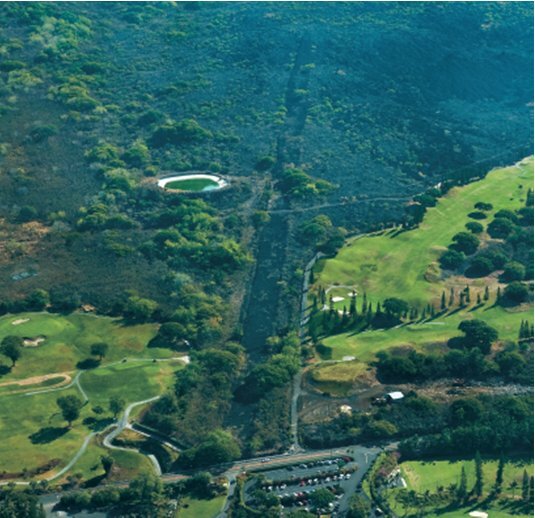 The Keauhou hōlua is the largest and best-preserved hōlua course. The remains are about 1290 feet long of the original that was over 4000 feet long. When in use, it was covered in dirt and wet grass to make it slippery. Contestants reached treacherous speeds on their narrow sleds by adding thatching and mats to make the holua slippery. When the waves were large, crowds would gather on a stone platform at He‘eia Bay to watch as hōlua contestants raced against surfers to a shoreline finish. 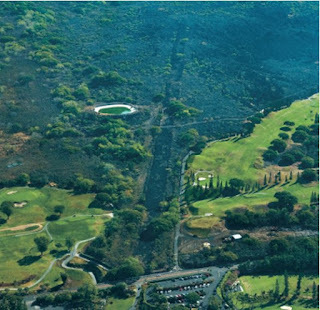 A portion of the hōlua is visible on Alii Drive, directly mauka (inland) of the golf clubhouse entrance. Kauikeauoli, born at Keauhou and later to become ruler of the entire island chain (as Kamehameha III,) was reportedly a great athlete and especially enjoyed hōlua sliding. There are other hōlua in the islands. One, on Kaua‘i, has two slides crossing each other on a pu‘u, northwest of Kōloa; another is a well-preserved 400- to 500-foot long hōlua near Kapua, South Kona. The image shows the hōlua at Keauhou, in addition, I have added some other holua images in a folder of like name in the Photos section on my Facebook page.